All the wrestlers above profiles on the website, you can click on their names to go straight to it. They tie-up to kick things off and trade elbows before SAKI throws down Fujigasaki by her hair. Fujigasaki returns the favor but SAKI throws down Fujigasaki by her hair again. SAKI stomps on Fujigasaki but Fujigasaki hits a diving double chop for a two count cover. Fujigasaki applies a Muta Lock but SAKI gets out of it and hits a trio of snapmares before applying a stretch hold. Fujigasaki kicks SAKI and throws her into the corner, Irish whip by Fujigasaki and she dropkicks SAKI. Face crusher by SAKI, cover, but it gets a two count. SAKI applies a crab hold, she releases the hold and goes for a reverse splash off the ropes, but Fujigasaki moves out of the way. Scoop slam by Fujigasaki and she covers SAKI for two. SAKI and Fujigasaki trade elbows until Fujigasaki hits a trio of dropkicks, Fujigasaki picks up SAKI but SAKI blocks the scoop slam. Backslide by SAKI, but Fujigasaki kicks out at two. SAKI applies a bodyscissors and rolls Fujigasaki around the ring before applying a Camel Clutch. Fujigasaki wiggles to the ropes to get the break, SAKI picks her up and hits a snapmare but Fujigasaki jumps up on the second turnbuckle and hits a sunset flip for a two count. A backslide doesn’t work either, Fujigasaki goes off the ropes but SAKI grabs her and applies a stretch hold. SAKI puts Fujigasaki in the Rocking Horse, she picks up Fujigasaki and hits a scoop slam. SAKI goes up to the top turnbuckle but Fujigasaki avoids the reverse splash. Fujigasaki goes up top and hits a missile dropkick, she grabs SAKI and hits a wrist-clutch Northern Lights Suplex for a two count. Scoop slam by Fujigasaki, she goes up top but SAKI avoids the diving bodypress. SAKI goes off the ropes and hits a pair of shoulderblocks. Another shoulderblock by SAKI and she covers Fujigasaki for two. SAKI picks up Fujigasaki but Fujigasaki sneaks in an inside cradle for two. Wing Clutch Hold by Fujigasaki, but it gets a two as well. Irish whip by Fujigasaki but SAKI hits a vertical suplex. SAKI slams Fujigasaki near the corner, she goes to the second turnbuckle and hits the reverse senton splash for the three count! SAKI wins! I wouldn’t say this was good, I can’t really think of any positive words to say actually. There were a lot of things here that didn’t quite work, and when a vertical suplex is the big setup move for the finish it is not a great sign. It went longer than it needed to as they ran out of things to do around minute four, and aside from a unique finish there is no real reason to watch this one. Nakamori and Eri begin the match and Nakamori tosses Eri to the mat. Nakamori tosses her down again but KAZUKI kicks her from the apron. KAZUKI gets in the ring, they throw Nakamori into the corner and both hit running strikes. DDT by Eri and Nakamori eats a double dropkick. Eri and KAZUKI apply leg submission holds before letting the hold go, snapmares by Eri to Nakamori but Nakamori boots her to the mat and tags in Kana. Kana and Eri have an elbow battle that doesn’t go well for Eri, and Kana dropkicks Eri to the mat. They trade elbows again, dropkick by Eri but Kana stays up. Kana kicks Eri in the chest a few times but Eri catches one and applies an ankle hold. Kana rolls out of it but Eri gets the hold re-applied, Kana suplexes her way out of the hold but Eri hits a tornado DDT for a two count. Eri tags in KAZUKI and KAZUKI kicks Kana in the leg. Reverse double kneedrop by KAZUKI near the corner, she goes up top but Kana avoids the diving kneedrop. Nakamori comes in but KAZUKI kicks Nakamori back, Kana catapults off Nakamori’s back and kicks KAZUKI in the corner. Kana kicks KAZUKI and goes for the chickenwing, but KAZUKI gets out of it. KAZUKI picks up Kana but Kana blocks the cutter and kicks KAZUKI in the head for a two count cover. Crossface chickenwing by Kana but Eri gets by Nakamori to break it up. Kana tags in Nakamori, Nakamori goes up top and hits a missile dropkick on KAZUKI. Nakamori goes up again and hits another missile dropkick, fisherman suplex by Nakamori to KAZUKI and it gets a two count. Nakamori kicks KAZUKI in the leg and goes off the ropes, but KAZUKI knees her in the stomach. KAZUKI goes up top but Nakamori kicks her and joins her. Eri comes in but Kana also runs in and she suplexes Eri. Avalanche Fisherman Buster by Nakamori to KAZUKI, but KAZUKI barely gets a shoulder up. Nakamori goes for a Capture Buster by KAZUKI blocks it, Kana comes in but KAZUKI ducks their kicks. KAZUKI drops Nakamori onto Kana, she picks Nakamori back up and slams her to the mat for a two count. KAZUKI tags in Eri and Eri dropkicks Nakamori. DDT by Eri, she picks up Nakamori but Nakamori hits a fisherman suplex. Eri comes back with another DDT, but the cover gets two. Codebreaker by KAZUKI to Nakamori, and Eri rolls up Nakamori for a two count. Eri and Nakamori trade strikes, Eri goes off the ropes but Kana elbows her. KAZUKI knocks down Kana and then hits a backdrop suplex onto Nakamori. Eri tries a few quick pins on Nakamori with no luck, Eri goes off the ropes but Nakamori boots her. KAZUKI boots Nakamori so that Eri can roll her up, but Kana breaks up the count. Kana and Nakamori both kick Eri, but KAZUKI breaks up the pin. Shining Wizard by Nakamori to Eri, but Eri barely gets a shoulder up. Nakamori picks up Eri and she plants her with the Chinkonka Driver, and she picks up the three count! Hanako Nakamori and Kana are your winners. This had some good moments but the flow just felt off. It was utterly non-gripping in terms of being captivating, I think partly because it had no structure to speak of. It was just random action until the match randomly ended with no real drama or emotion. 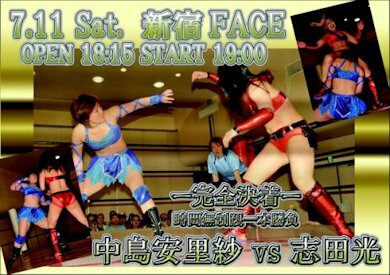 I love Kana but I still can’t recommend this match, just pretty average all things considered. After trading holds for a bit, armdrag by Shida but Nakajima armdrags her back. Irish whip by Shida and she knocks down Nakajima with a hip attack. Another hip attack by Shida and she hits a backbreaker. Shida punches Nakajima in the back, Irish whip to the corner and she hits a jumping knee for a two count. Shida applies a crab hold but Nakajima crawls to the ropes to force the break. Backbreaker by Shida but Nakajima plants her with a DDT followed by a dropkick. Nakajima applies a kneelock and then a single leg crab hold before pulling on Shida’s hair. Knee by Nakajima and she hits another one in the corner, Irish whip by Nakajima and she jumps up on the top turnbuckle, but Shida pushes her to the apron. Shida joins Nakajima on the apron and they trade elbows, a battle that Nakajima gets the better of as Shida crashes to the mat. Nakajima gets on the top turnbuckle but Shida throws a kendo stick at her to knock her to the floor. Nakajima gets a hair and hits Shida with it, and they trade blows with their respective weapons. Shida surprisingly gets the better of it and she hits Nakajima repeatedly with the stick. They battle around the ring, with Shida slamming Nakajima’s back into the apron. Nakajima throws Shida into the chairs as a retort before slamming her head into the ring post. Nakajima then gets on the apron and hits a missile dropkick down to the floor, Nakajima slides Shida back in and hits another missile dropkick. Shida elbows Nakajima as they trade shots, release German suplex by Nakajima and she knees Shida against the ropes. Running boot by Nakajima and she hits a footstomp to Shida’s stomach. Rolling Germans by Nakajima, she goes up top but Shida joins her and knocks Nakajima to the apron. Shida grabs Shida while on the second turnbuckle and suplexes Nakajima back into the ring. Shida goes up top and hits a missile dropkick, cover by Shida but it gets two. Shida goes off the ropes and hits an enzuigiri, facebuster by Shida and she applies a chinlock. Nakajima gets to the ropes to get the break, Shida picks her up and hits a backbreaker. Shida picks up Nakajima again but Nakajima slides away and sneaks in a schoolboy for two. Release German suplex by Nakajima and both wrestlers are down on the mat. They trade elbows as they return to their feet, Shida goes off the ropes but Nakajima blocks the knee. Shida blocks Nakajima’s kick also but Nakajima drops her with a release dragon suplex. Elbows by Nakajima, she picks up Shida but Shida blocks the suplex. Nakajima goes off the ropes but Shida hits a jumping knee. Shida puts Nakajima on the top turnbuckle, she joins her but Nakajima headbutts her off. Shida avoids the diving footstomp however and knees Nakajima in the back, Three Count by Shida but Nakajima gets a shoulder up. Falcon Arrow by Shida, but again the cover gets two. Shida knees Nakajima in the head a few times, she tries to go off the ropes but Nakajima hits a package suplex for a two count. Nakajima goes for a dragon suplex but Shida blocks it and applies an inside cradle for two. Nakajima charges Shida but Shida hits a tilt-a-whirl backbreaker. Fireman’s carry backbreaker by Nakajima, she puts Nakajima on the top turnbuckle and drops her back-first onto the top turnbuckle. Cover by Shida, but Nakajima barely kicks out. Shida goes off the ropes and hits a Three Count, but Nakajima quickly rolls her up for two. German suplex by Nakajima but Shida hits a Three Count. Shida nails the Tamashii no Three Count, and she gets the three count pinfall! Hikaru Shida wins the match! This match is for the JWP Tag Team and Daily Sports Tag Team Championship. Miyu and Hagane attack before the match starts and isolate Leon in the ring. Leon kicks Hagane away and scoop slams Miyu on top of her before hitting a footstomp on her. Ray runs in and they hit a double dropkick on Hagane, cover by Leon but it gets two. Leon tries to slam Hagane with no luck, and Hagane slams her instead. Body press by Hagane but Leon easily kicks out. Hagane tags in Miyu and Miyu dropkicks Leon. Miyu throws Leon into the corner and stands on her, Irish whip by Miyu but Leon hits a tilt-a-whirl backbreaker. Leon tags in Ray, and Ray knocks down Miyu in the corner, she puts Miyu in the ropes and dropkicks her in the back. Ray covers Miyu but Miyu bridges out of it, she goes off the ropes but Leon kicks her from the apron. Miyu armdrags both of them, Hagane lariats Ray and Miyu hits a tornado DDT. Vertical suplex by Miyu and she tags in Hagane. Hagane dropkicks Ray but Ray hits a tilt-a-whirl headscissors. Leon goes up top and hits a missile dropkick on Hagane, she covers Hagane but it gets two. Hagane goes for a suplex but Leon lands on her feet, Leon goes for a spear but Hagane blocks it. Leon rolls behind Hagane’s back and dropkicks her in the head, and back up they trade elbows. Hagane goes off the ropes but Leon picks her up and drives Hagane into the corner so that Ray can hit a slingshot dropkick. Leon charges Hagane and hits a shoulder tackle, double Irish whip to Hagane but she hits a double lariat. Hagane picks up Leon and puts her upside down in the corner before hitting a body avalanche. Miyu comes in to help and they double team Leon, Hagane goes to the corner and she hits a reverse splash for a two count. Hagane goes up top but Leon avoids the dive, knees by Leon but Hagane catches her with a powerslam. Hagane tags in Miyu and Miyu hits a missile dropkick. Miyu goes up top and hits another missile dropkick to Leon, but Leon kicks out of the cover. Miyu slaps Leon but Leon picks her up and tosses Miyu out of the ring. Hagane runs in but she gets dumped to the floor also, Ray goes for a moonsault but Hagane pulls her out of the ring, Miyu then goes up top and she dives out onto both Leon and Ray with a plancha suicida. Hagane gets on the apron, she picks up Miyu in a press slam and throws her onto both their opponents. Hagane rolls Leon back in, Miyu goes up top and she goes off Hagane’s shoulders with a senton. Hard elbow by Miyu, and she covers Leon for another two count. Miyu goes up top but Ray runs in and kicks her in the head before she can jump off. Leon joins Miyu up top and she hits an avalanche fisherman buster, cover by Leon but Miyu gets a shoulder up. Leon picks up Miyu but Miyu gets away, Leon destroys Miyu with a spear but Hagane breaks up the cover. Quick roll-up by Miyu for two, but Leon hits a heel kick. Miyu ducks the next one, elbows by Miyu and she nails the Rabbit Suplex Hold but it is broken up by Ray. Spinning kick by Leon and she makes the tag to Ray while Hagane is also tagged in. Ray hits the Space Rolling Elbow in the corner followed by the Sling Blade, Ray picks up Hagane as Leon comes back in but Hagane hits a double backdrop suplex. Lariat by Hagane to Ray, Miyu goes up top as does Hagane, and Ray jumps off Hagane’s back with a footstomp. Reverse Splash by Hagane, but Leon barely breaks up the cover. Hagane goes up top again and she nails the diving body press, but Ray gets a shoulder up. Leon runs in and spears Hagane, with Ray following with a tiger feint kick. Ray picks up Hagane as Miyu goes up top, but Miyu missile dropkicks Hagane by accident. Leon goes up top and hits a Swanton Bomb, Ray follows with a moonsault but Miyu breaks up the cover. Miyu suplexes Ray and hits a cutter onto Leon, lariat by Hagane to Ray but it only gets two. Hagane goes for the Rainmaker but Ray ducks it and hits a hurricanrana, but Hagane rolls through it. Leon breaks that up, double superkick to Hagane and Leon hits another spinning heel kick as does Ray. Ray goes up to the top turnbuckle and she nails the Skytwister Press, picking up the three count pinfall! Leon and Ray are still your champions. This match is for the JWP Openweight Championship. Haruyama knocks down Bolshoi right as the match starts but Bolshoi returns to her feet and they lock knuckles. Bolshoi goes for Haruyama’s arm but Haruyama gets out of it, Bolshoi applies a sleeper but Haruyama rolls away. Bolshoi goes for a triangle choke but that doesn’t work either as Haruyama slams Bolshoi to the mat to get out of it. Waistlock by Bolshoi and she applies a short armbar, Haruyama gets out of it and she hits a lariat. Irish whip by Haruyama and she blocks Bolshoi’s headscissors attempt. Haruyama applies a double underhook and hits a facebuster, she then picks up Bolshoi and hits a second one. Haruyama goes for a third but Bolshoi blocks it and they trade elbows. Lariat by Haruyama, she goes up top but Bolshoi smacks her and joins her. Haruyama snaps Bolshoi over the top rope and knocks her back into the ring, Haruyama goes up top but Bolshoi recovers and joins her again. Avalanche uranage by Bolshoi, cover, but Haruyama gets a shoulder up. Back up, Haruyama kicks Bolshoi into the corner and hits repeated short range lariats. Haruyama puts Bolshoi on the top turnbuckle but Bolshoi grabs her arm and applies an armbar. Bolshoi stays up top but Haruyama hits her and goes up as well, hitting a powerslam to the mat. Haruyama goes off the ropes and hits a sliding lariat, but Bolshoi kicks out of the cover. Haruyama picks up Bolshoi but Bolshoi hits a tiger feint kick followed by a palm strike. Another tiger feint kick and Bolshoi applies La Mistica, double reverse armbar by Bolshoi and she covers Haruyama for two. Tiger suplex hold by Bolshoi, but that gets two as well. Bolshoi picks up Haruyama and tries to get her on her shoulders, but Haruyama knees out of it. Dragon screw leg whip by Bolshoi but Haruyama hits a few lariats. Palm strike by Bolshoi, she gets Haruyama on her shoulders and she hits a Samoan Driver for a two count. Bolshoi goes off the ropes but Haruyama picks her up and hits a modified Emerald Frosion for two. Haruyama stomps Bolshoi and goes up top but Bolshoi hits a palm strike. Haruyama hits a diving guillotine legdrop, she goes back up top and hits another one but Bolshoi barely kicks out. Haruyama picks up Bolshoi but Bolshoi hits a hurricanrana, but Haruyama rolls through it for two. Haruyama kicks Bolshoi, she picks her up but Bolshoi slides away and hits a palm strike. Lariats by Haruyama and she hits one final one for a two count. Haruyama picks up Bolshoi but Bolshoi hits a crucifix hold for two. Bolshoi charges Haruyama and delivers the Piko Knee Smash, she runs at Haruyama and hits a second one. One final Piko Knee Smash by Bolshoi, cover, but Haruyama barely gets a shoulder up. Bolshoi picks up Haruyama and hits a Michinoku Driver, but Haruyama again kicks out. Bolshoi goes off the ropes and hits a palm strike, but Haruyama fires back with a lariat. Another palm strike by Bolshoi but Haruyama hits a lariat. Haruyama and Bolshoi trade blows, with Haruyama hitting a lariat to win the battle. Haruyama goes off the ropes and hits another lariat, sliding lariat by Haruyama but the cover gets a two count. Haruyama picks up Bolshoi but Bolshoi gets on her shoulders, and she hits the Limelight for the three count! Bolshoi is the new champion! I knew from the line-up that this event had a lot of potential, but it delivered far beyond my expectations. The last three matches are ones I can legitimately recommend without any hesitation, with the Shida/Nakajima match in particular being aces. Really the opener was the only bad match, as while the Kana tag wasn’t great it was serviceable and worked fine in the mid-card. The only thing holding the event back is simply that there were only five matches, so there was under an hour and a half of in-ring action here. But what was here was fantastic, probably the best Joshi event I have seen so far this year as it had no clipping, allowing the matches to speak for themselves. Definitely track it down, if you like Joshi or are trying to get into it you won’t be disappointed.